When I was teaching first grade, one of the most important question parents asked me was how they could help their child succeed as a learner. My answer was often met with silence and a request for more…..but I held fast to my response. Simple, direct, and to the point. Read to them every day. 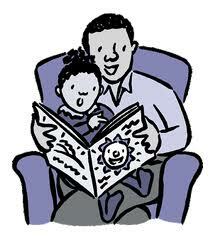 By reading to your child from a very young age – you are setting the stage for a lifelong love of reading – and learning. And there are many other complex things that are taking place as you read to your child – depending on their age which I will touch on in later postings. But for now – let’s just simply say that reading to your child every day (from when they are in the womb) is an easy, cheap, lovely way to spend some time with your little one as you enrich and nurture their love of reading. So grab a good book, put your feet up, pull a little one or not so little one (reading together should be a long term activity…not just until your child enters school) into your lap….and have fun!